For the invaluable and unselfish work that Karl Holm did for the Norwegian community and for the City of New York, he received many forms of recognition. His Majesty, King Haakon, appointed Karl Holm Knight of St. Olav’s Order, 1 st Class. It was especially during the Depression years that Holm began his work among the down-and-out. For many people, and Norwegians were no exception, these were hard times. The well-known shanty town, “ Ørkenen Sur “Bitter Desert", was for many years his workplace. Between 500 and 600 Norwegians were permanent “ residents “ of this squatters' village that they set up in the Red Hook section of Brooklyn.  Their “ homes “ were huts made of packing crates and boxes, and others dug themselves holes in the ground and laid corrugated metal sheets over them..
Countless were the countrymen that Holm was able to help there. Soup kitchens were set up with the assistance of many people from the various Scandinavian churches. Day after day, many kind and sympathetic citizens and merchants supplied food and clothing for the needy. It was a huge undertaking to continually solicit donations, mobilize volunteers, prepare food, process clothing and distribute what needed over a period of years. In many cases there was a wife or parents in Norway who waited for the husband or son. Holm was able to be the tool to make new contacts between many of these down-and-outers and their homes in Norway. 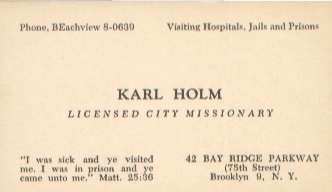 In later years, Holm worked with hospital and prison visitation. He made over 500 hospital visits each year. Also in the prisons, he was a frequent visitor, and maintained contact with the men over the years. Every Christmas, family and friends were mobilized to pack shoeboxes with goodies for the Norwegians that were in the hospitals and prisons. Each box always had a Scripture portion and a tract, which he hoped would help lead them to salvation in Christ. Endless numbers of men knocked on his door in Brooklyn. Both Karl and Karoline always welcomed them in. Bestemor would make the coffee and sandwiches, while Bestefar and their guest talked. Besides enjoying a visit, many a problem was addressed over coffee. Bestefar would always close by praying. Holm maintained extensive files on the Scandinavian community which he used in his work. He kept files on all the people he visited, not only in the hospitals and prisons, but also in the morgues. He also clipped articles involving Scandinavians from the newspapers. The information from his files was invaluable for his dealings with families in Norway, consulates, and the police department.